Is there anything better? I mean, really? Chocolate, even bacon doesn’t compare to the perfect roast chicken. You know the chicken I’m talking about. The one that lingered in the over for an hour enjoying its warm potato and onion scented sauna. The rosemary sprig that perfectly flavored its crispy skin. The drippings that ooze onto the plate because it’s perfectly moist with a delicate crispy skin and a salty brine-infused flesh. Mmmmmm. Naughty chicken. 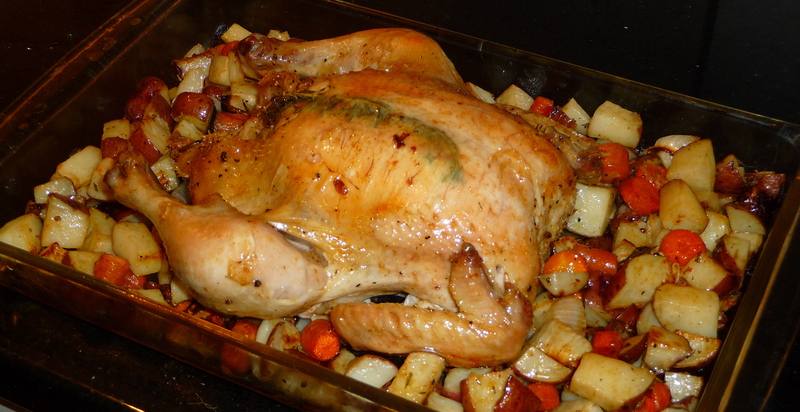 Last night I accomplished a perfect roast chicken (one of many, if I do say so myself) accompanied by roasted potatoes, onions and carrots, all bathed in rosemary, olive oil and kosher salt. First, I brined the bird in water with about 1/4 cup kosher salt, 1/4 cup brown sugar, a few grinds of fresh pepper, and a few sprigs of rosemary. Forgot about it in the fridge for about 2 hours. When ready to cook, I rinsed the bird, dried it with a paper towel and rubbed it with olive oil, more kosher salt and pepper and rosemary. Inside the cavity I crushed a few cloves of garlic and a few more sprigs of rosemary. I also tucked some crushed garlic and a sprig of rosemary under the skin on the breast to add extra flavor (that’s the green-ish line going down the back of the bird). In the over at 350 degrees for about 30 minutes covered, then up to 400 degrees for another about 40 minutes. This baby needs time. Don’t deprive them of their luxurious sauna. I mixed the potatoes/onions/carrots in the same olive oil/salt/pepper/rosemary combo and tossed them into a separate pan to roast. Mostly I do this because I find the fat from the chicken tends to make the veggies too oily if I put them in the same pan. Alas, I still spooned some of the chicken drippings over the potatoes before serving. Naughty Lindsey.